Quaker House is located right next door at 2121 Decatur Place NW. See below for driving / parking and Metro train and bus directions or view a larger Google map to create your own customized travel directions from your starting location. You may wish to take the Metro. On-street parking is sometimes difficult. 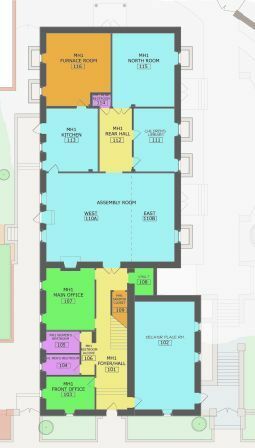 The main entrance is on the Decatur Place side of the building (and is shown on this map), although on Sundays and at certain other times, entrances through the garden gates may be open. To reach Quaker House, keep walking west down Decatur Place NW away from Florida Avenue to the next building. Worship services, committee meetings, child care, classes, special events, and other gatherings are held in different rooms throughout the building or next door in Quaker House. 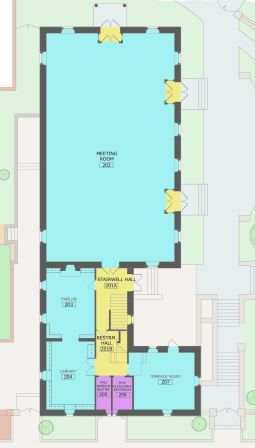 Click for maps of the Meetinghouse interior--First Floor, Second Floor and Third Floor. From the northwest: From I-270, go east on Route 495 (Beltway) toward Silver Spring. In 7.8 miles, take the Connecticut Avenue exit South toward Chevy Chase. Go about 6 miles on Connecticut, past the Zoo on your left, next over a high bridge which crosses the park, then look for the Washington Hilton Hotel on the left. Just past the hotel, take a right turn onto Florida Avenue. In a half a block or so, the Meetinghouse will appear on the right. Look for wrought iron fences and a garden. From the northeast: From I-95 going south, take Exit 27, route 495 (Beltway) west toward Silver Spring. Merge onto New Hampshire Ave NE via EXIT 28B toward Takoma Park (Crossing into District of Columbia).Turn slight left onto New Hampshire Ave NW. Pass through 1 roundabout. New Hampshire Ave NW becomes Sherman Ave NW. Turn right onto Columbia Rd NW. Columbia Rd NW is just past Irving St NW. If you reach Hobart Pl NW you've gone a little too far. Go about 1/2 mile, and turn left onto 16th St NW. 16th St NW is just past 15th St NW. If you are on Columbia Rd NW and reach Harvard St NW you've gone a little too far. Go another 1/2 mile, past Meridian Hill Park, and make a right on Florida Ave. N.W. Go .7 miles on Florida, crossing over Connecticut. The Meeting House is on your right between Phelps Place and Decatur Place. From the east: Come west on Route 50 into D.C., and continue west on New York Ave. Just past 4th St. NE, turn right onto Florida Avenue NE (if you reach O St. NE, you've gone too far). Continue on Florida across the city (there's a jog you need to take on R Street), crossing over Connecticut. The Meeting House is on your right between Phelps Place and Decatur Place. From the south: From I-95 going north, take I-395 directly to the 14th Street Bridge over the Potomac River. Stay on 14th Street for more than a mile, watching the letter streets go down the alphabet until you get to R Street. Turn left onto R, go several blocks, crossing over Connecticut Avenue. Turn right onto Florida Avenue, and go a half block. The Meetinghouse is on the left, set back behind the stone fence and holly trees. From the southwest: From I-66 East, go across the Roosevelt Bridge. The bridge empties out into Constitution Avenue. Go five blocks, then turn left onto 18th St. Go about a mile, watching the letter streets go down the alphabet until you get to R Street. Turn left onto R, go several blocks, crossing over Connecticut Avenue. Turn right onto Florida Avenue, and go a half block. The Meetinghouse is on the left, set back behind the stone fence and holly trees. From western suburbs: Come down Massachusetts Ave. NW, continuing over the bridge over Rock Creek Park. Pass the Mosque on your left. A few blocks later (after S Street), turn left onto Decatur Place. The Meetinghouse is located where Decatur ends in a T intersection with Florida Ave.
(1) The first is in the Universal Building at 2005 Florida Ave. That's just across Connecticut Avenue on the left when heading east from the Meetinghouse, between the drug store and the post office. This garage is open from 7 AM to 10 pm from Monday through Saturday and 4 PM to midnight on Sunday. The door says "permit parking only," but one-day parking is OK. Please note: both parking garages require a credit card for payment. 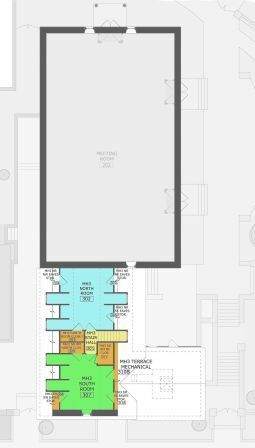 (3) 1666 Connecticut Avenue Parking Garage, which is actually on R Street near Sette Osterio. They take cash, but close at 6:30 pm. Take the Metro Red Line to Dupont Circle Station. From the Orange, Blue, or Silver lines, you can transfer to the Red Line at Metro Center. From the Green or Yellow Lines, you can transfer to the Red Line at Gallery Place-Chinatown. If you're coming on the weekend, we encourage you to check WMATA's website for possible track work prior to your trip. When you get off at Dupont Circle: Take the Q Street exit from Metro; Connecticut Ave. is within sight. Walk north (uphill) on Connecticut Ave. approximately two and a half blocks to Florida Avenue; turn left on Florida and walk approximately half a block to the Meetinghouse on the right. Look for our front garden. Numerous Metrobus lines also serve Dupont Circle from various other neighborhoods. Use WMATA's trip planner or Google Maps (top of this page) to plan your trip.